A few months ago, I wrote an article about the personal savings rate stabilizing and more Americans seemed to be spending money on Christmas in 2010 vs 2009. I was very curious to see if we’re just stupid Americans who saved a little money and are now off spending like brainless idiots again. So I’ve decided to revisit the data from the US department of commerce and see what we’re doing as a whole and I was pleasantly surprised. Despite the crappy interest rates of late, people still seem to be squirreling away a little more money. I’ve attached the latest data below. Personal savings has managed to go up ever so slightly at about 0.3% since this time last year, which is great. I’m looking forward to looking at this data again after tax season is over. I’d like to see if people are going to spend their income tax returns like they did in 2010 or if they’re going to stockpile some of it away like we saw in 08 and 09. I’ll report back again in about 6 months. Very interesting chart! Whatever happened in 2008 to warrant such a spike after April? Good to know it is on the rise. Tax Rebates. The governement gave out rebates in May. Any idea if forgiven debt is included in that? Personal saving (3–8) is personal income less the sum of personal outlays and personal current taxes. It is the current saving of individuals (including proprietors and partnerships), nonprofit institutions that primarily serve households, life insurance carriers, private noninsured welfare funds, private noninsured pension plans, publicly administered government employee retirement plans, and private trust funds. Personal saving may also be viewed as the net acquisition of financial assets (such as cash and deposits, securities, and the change in life insurance and pension fund reserves), plus the net investment in produced assets (such as residential housing, less depreciation), less the net increase in financial liabilities (such as mortgage debt, consumer credit, and security credit), less net capital transfers received. Best as I can tell from that definition, I think yes. I just got my federal tax refund and am trying to figure out if it would be better to park it in savings (at a paltry 1% interest) or to put it towards mortgage principal curtailment. I already add to principal curtailment every month when I pay the mortgage, but I’m not sure if the refund could give me much of a boost. Can anyone suggest a good online mortgage calculator that can help me run through the scenario? I tried adding the one-time payment AND the monthly pre-payment to the calculator I usually use and it didn’t seem to make much difference in payoff date; that leads me to believe the calculator may be flawed. Linda – individual payments always seem to have a small impact. Like I’d pay a few thousand extra on my mortgage and it would only decrease my monthly interest by like $20 (but $20xterm of loan does add up). I’ve always liked the bankrate.com calculators myself. Total pessimist here. As a matter of fact, yesterday State Farm mailed me their Good Neighbor magazine and in it was a whole article on the Trend of Thrifty complete with an infograph on smart ways to save money which included a lot of the tips we’ve been seeing for ages now. I actually meant to bring it home and scan it but someone spilled something on it. I just don’t believe the hype. I think people are still being FORCED to save and that’s what you’re seeing. I think jobs are still threatened and people know it. I mean think of the gov’t shutdown. If those people didn’t start throwing money into savings? There are budget cuts everywhere and those impact jobs. In the state of FL, we’re seeing cuts like crazy across the board and with it goes jobs. When the economy really starts feeling stable, you’ll see the savings drop again. Guaranteed. Mutant – certainly that the treat of layoffs was one of my reasons for buckling down a couple of years ago, and I myself am saving more than I did in 2008, but I also hope that my savings stays at the level it is now and doesn’t bounce back to those days. I agree on this too- companies are still having ‘real’ layoffs, people are still losing their jobs and not being able to find ones to replace them… I am looking for even more ways to save since our company announced they will be laying off our largest department. It MAY not affect my job- but it might because I’m in a support department (accounting). Until we know for sure I’m throwing as much money into savings as possible- and I am surely not spending our tax refund on anything! I guess there definitely seems a correlation between pessimism and/or bad news and savings. Len’s a great guy. I’m sure he’ll find something in no time flat. We have definitely been saving a LOT more than we used to. But we aren’t just saving to save- we have the goal of a new house in mind. I really hope that once we build I can keep my husband on the saving track. It is really nice knowing we have money in the bank in case we need it. Hoping that we don’t need it, but having it just in case. My husband doesn’t really realize how much peace of mind that actually gives me. Sandy – ditto about the peace of mind. I didn’t like the idea of having to scramble to find a job quick if we were impacted by a job loss or health issue. I think that people have been witnessing the price of gasoline increase gradually throughout the winter and realize that prices are going up. They are curtailing spending preparing for more expensive basic living expenses. I would also suspect that the lack of job security mentioned in some of the other comments is another reason. People are preparing for a secondary recession. Optionsdude – Good Point. I know when gas first started going up a few years back, my heating bill went up by like $1000 for the season, maybe a little more, and that doesn’t include the secondary effects of oil prices like higher food and transportation costs. Not everyone has that kind of wiggle room in their budget (or jobs that rise at the same rate as inflation). American are still gun shy from the recession. Once the economy recovery gets into full swing we’ll be spending like it was 1999! The recovery looks like it will be a slow one for the general public though. Our local unemployment rate is still close to 10%. RB40 – It’s so strange because the effect seems so regional. It seems like on the east and west coasts (especially in big metro areas) the economy is back in full swing. I hate the way the effects are lingering for state workers. I want a raise! Imagine what the savings rate might be if there were actual incentives to save instead of disincentives like extremely low interest rates and taxes on that interest. When interest rates are lower than the rate of inflation, the rational person should spend their money instead of save. Well, it’s definitely interesting that savings rates increased during the peak of our recession. I guess it scared people into saving. 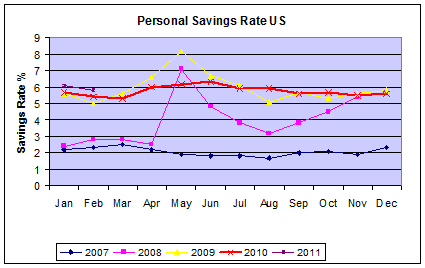 However, I noticed that in 2010, that savings rate was a little bit less than 2009. It will be interesting to see how 2011 plays out. Already Jan. and Feb. are slightly higher than 2010, but will it continue in that direction? I am shocked so many people saved the money they received from the government in 2008/2009 (assuming that is the reason for the savings spike). I think it is funny that the money was supposed to be used to stimulate the economy and many saved it instead. It’s interesting that almost no one was saving in 2007/2008 (I had a small amount of savings then, but nothing much) when rates were good, but now that rates are swirling the drain, people are saving more than they have previously. It’s nice to be rewarded for doing the right thing with low interest rates. I’m glad to see that the personal savings rate is increasing – at least comparing against the same months in prior years, anyway. Perhaps the recent economic troubles in the US have influenced people to change their behavior? I’m glad to see the increase no matter the motivation. It does drive me crazy to listen to the media talk about why people spend or save- it’s often attached to ideas of what people think they deserve and not about how much money they actually have to spend! I wish more people would save out of wanting to and feeling good about it rather than being ‘forced’ to. One can dream! It’s good to see that savings rates have increased, but they are still at really low levels. We still have a long way to go compared to the savings habits of people in other countries. What does a 6% savings rate mean exactly? I can’t imagine it means that Americans only save 6% of their income……. can it? We are spending more than our means and we forget at times to save for our future. Hopefully, we will learn how to spend our money wisely and will refrain from overspending our credit cards.